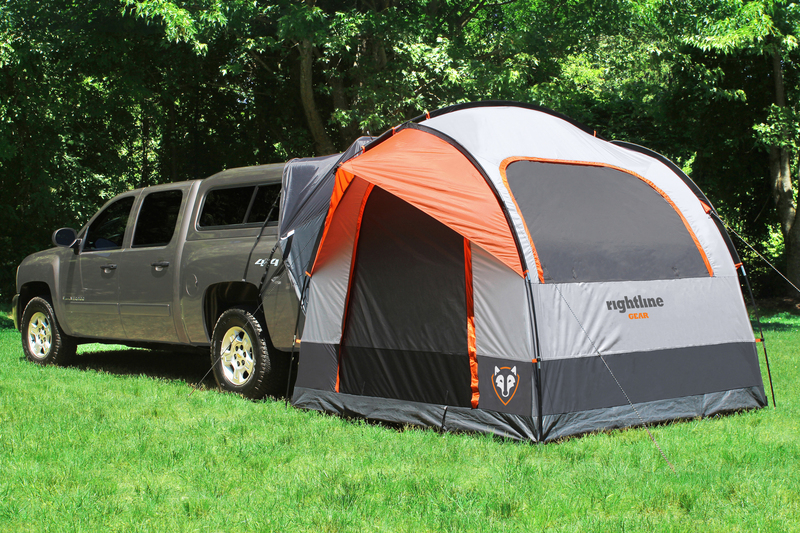 Truck caps, toppers, camper shells… whatever you call them, Rightline Gear SUV Tents have always been able to fit around them. We have never taken photos to show this setup before now (for some crazy reason?). The SUV Tent is a natural for this type of camping. The vehicle sleeve of the SUV Tent goes around the rear of the Truck just like it goes around the rear of an SUV, minivan, crossover, wagon, etc. 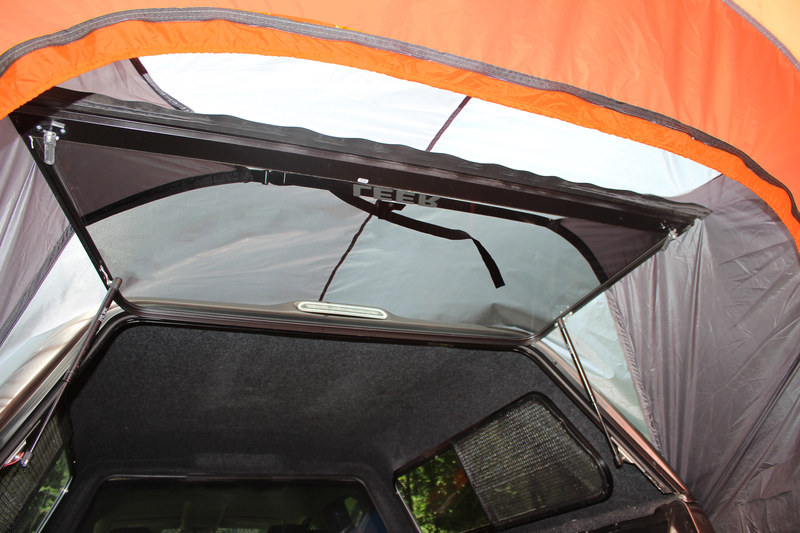 The rear window of the topper raises up, the lower sleeve straps over it, and the upper sleeve is supported. The rear window functions just like the rear hatch door with the other vehicles. The (2) longer orange straps that normally extend into the SUV will extend into the truck bed. It is easiest to attach them to the rear corner cleats of the truck bed, however, there are other places available for them to attach as well. The center orange strap attaches on or close to the rear license plate. The black outer straps attach to the same locations as they do on the other vehicles. The most surprising thing about this set up is that the tailgate extends just a short distance into the tent itself. It will not get in your way. Now, you can sleep in the comfort of your truck bed, hopefully with a truck bed air mattress, and still have room to stand up when putting on your jeans in the morning. The extra space can also be used to sleep additional campers. Add the SUV Tent’s rainfly and you will be protected against the elements. The universal fit of the SUV Tent will allow it to work with any size pickup truck, F150 or Tacoma. Lifted trucks are not a problem. The SUV Tent can be left standing while you detach your truck and go about the days adventures. Please contact us if you have any questions about this set up. As far as protection against the corners of the truck shell window, our product team did not experience any tearing issues when it was tested for this article. However, if you wanted to be extra precautious, we could certainly suggest applying foam to the corners of the window. Please give us a call if you need any further assistance with this. Exactly what kind of truck is in your example of using the SUV tent with a Truck with a Leer camper? Please! Hello. The truck pictured with a cap attached to our SUV Tent is a Chevy Silverado. Most any make and model of truck and cap will work with our SUV Tent. I would like to order one of these lol please get me via email on price. Thank you! Is there a problem with how high the trucks are? How good is it seal around the camper shell and truck bed? Hello. 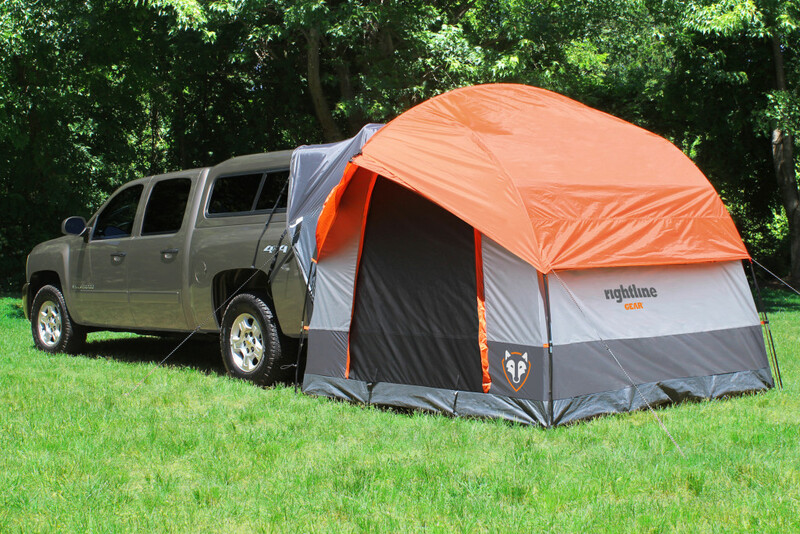 The SUV Tent will work with most stock trucks and camper shells. For more specific questions please contact our customer service team. For reference, the truck pictured in our photos is a Chevy Silverado. The seal around the truck and camper shell is quite good, and keeps out rain and bugs well. I’m interested in purchasing your product but my concern is that I have a 25oo Dodge 4×4 with a topper, if the tent did not fit do to the height of my truck what is your policy for returning. We have a F250 4×4 with Leer top 122- from ground to top of cap is 7 feet 10 inches. Our retailer called your company, forgot to tell him this measurement. Will the suv tent work? Hello Sue. Please give our product team a call at 888.685.GEAR and we can better discuss the fitment of the SUV Tent to your F-250. 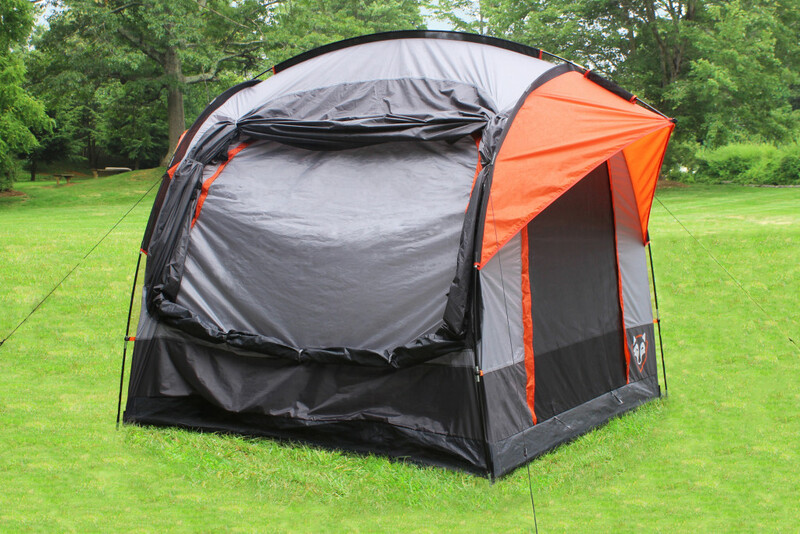 Hello interested in this tent for my 2010 Dodge Ram 1500 that has 20″ wheels and a Ranch Supreme Hi Rise Cap. I saw on some other sites about a maximum diameter that the vehicle can be was 24′ around. What is the max your tent can fit? Hi Tony. Please give our customer service team a call at 888.685.GEAR and we can discuss the SUV Tent fitting to your Dodge with a tall cap. I would like to buy your product but I have yet to see an answer published when someone asks if it will fit the truck and topper I have. I have a 2006 GMC SIerra 4 wheel Drive that has a Leer 122 topper on it. I want to know if it will fit that specific heigth of truck and topper combination. Hello Patrick. Please contact our customer service team at 888.685.GEAR and we are happy to discuss the fitment of the SUV Tent with your GMC. I have a 2017 Toyota hilux ute with a rear fibreglass canopy, and Iam interested in purc. hasing the rear SUV tent. I live near Whangarei in New Zealand and need to know the price plus postage etc. Hi Brendon. If you are interested in an SUV Tent, please contact our New Zealand distributor, Mustard Outdoors: https://mustardoutdoors.nz/. They can help confirm what the price will be. Hello Don. 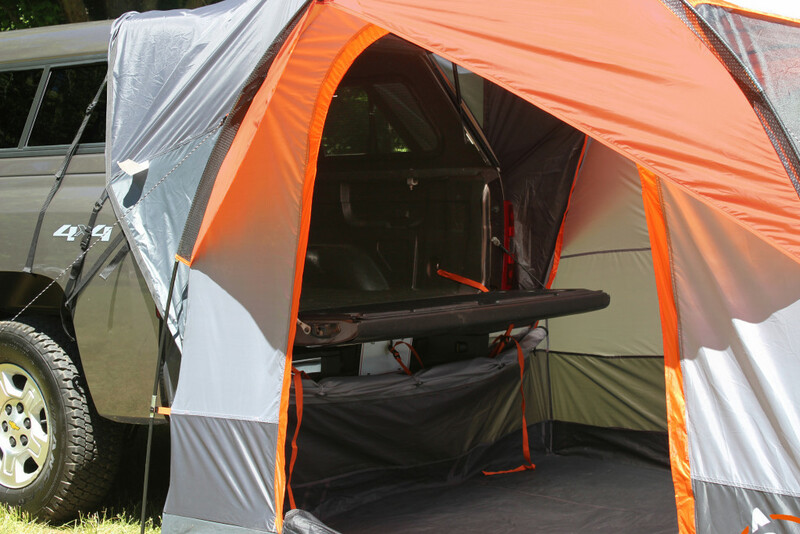 Our SUV Tent is only available with a door on the driver’s side of the tent. We chose to put the door on the driver’s side since the Jeep Wrangler tailgate swings open towards the passenger side. The Wrangler’s tailgate would block access to the tent if the door was on the passenger side. The SUV Tent 8′ long by 8′ wide and is 7.2′ tall in the center. If you have any additional questions feel free to give us a call at 888.685.GEAR. have a 2007 full size 4×4 tundra with a cab high ARE truck cap. measurement is 85″ from ground to top or camper door when opened. will your suv tent on truck cap fit over my raised camper door. send me dimensions please. what is the price. Hello Jim. As your Tundra is not taller than the height of the SUV Tent we feel the SUV Tent will fit your truck and truck cap. The tent’s dimensions are 8′ L x 8′ W x 7.2′ H. The price is $289.95. For any additional questions please give us a call at 888.685.GEAR.